Got it, thanks! That was where I'd figured. It would be great to have some sort of comprehensive list of coordinates related to the search, whether or not on Nikumaroro. Is this already on a database or thread somewhere? I'd start a thread but I don't want to be redundant if this has already been done. 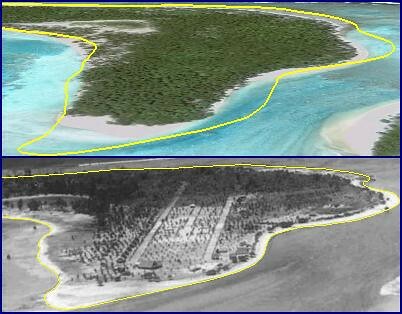 We have a Geographic information system (GIS) expert on the Earhart Project Advisory Committee who has a GIS database for Nikumaroro. Much of the information is proprietary and is intended solely for the use of TIGHAR teams. At one time I did start exploring how to set up a GIS server on tighar.org so that some of the information could be shared with the general public, but I got sidetracked before making any progress on the project. Feel free to ask for and to provide coordinates in this thread. We may be able to build up a .kmz file that can easily be updated and shared--I'm not too good at that, but I think it is what .kmz files are meant for. Or browse to the .kmz file's location and double-click on it. Wonderful! For me, using Google Earth is less about finding a fuzzy picture of the Electra or even really referring to definitive facts, than it is about avoiding asking stupid questions and wasting people's time. If I can find a place on Google Earth people are talking about, or if it's already marked, it's a lot more impressionable on my memory than just vaguely talking about that place or linking to its Wikipedia notation. -Underwater search areas by other searchers, I think NW of Howland. 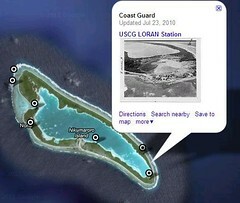 -Plane found in a lagoon on some island other than Gardner. May not be a plane. -Plane found by David Alan Atchason on Noumatong Islet. May not be a plane. -In-flight positions reported by Noonan. Do we have any? I think Van Asten listed coordinates east of Lae at some point but I don't know if he used his math to make those up, or actual reports, or where they're from. -Place Putnam thought the Electra was, NW of Howland, based I think mostly on clairvoyants' reports. -Colorado's position from which search planes were launched. Those are all in the .kmz file attached to my previous message. Thanks, yeah that's great already having Niku labeled. You don't have to find any of these other ones, I'm sure I'll locate them in time. But sharing .kmz files is a nice option when people find something new on GE or as the search progresses. And it's nice to have actual coordinates and maps to work with. Marty/Alex. Try clicking this MAP - or on the image below. Once there, then click on the location icons for popup balloons, and hot links to Ameliapedia. Doesn't require Google Earth. Here is a .kmz file for the Gallagher Highway and Government Station from Jim Thompson, our GIS guru. Thanks! Share and share alike. The government station = Now and Then! 1. In flight position 159-07-E ; 04-33.5-S was transmitted from aboard A/c @ 0720 GMT , based on sunset fix @ 071930 GMT , see recomputation EJN-2011 , not my math but mr.Noonan´s precalculation by H.O.no.208 . 2. mr.Putnam expected A/c NW of Howland , possibly since he heard of a northward offset landfall operation was in flight plan however , there have been "clairvoyants´" predictions in the play. Also , Putnam may have been supported by the commander of Itasca , who thought A/c to be NW since from there the distance to the 157 LOP was shortest. In 3rd instance Ameia reported 0843 (Navy) LZT "..flying north and south.."
Great stuff, thank you Martin, Erik, and H.A.C. Except for the fact that the position report was received in Lae at 0718 GMT, one and a half minutes prior to 0719:30 GMT, the time of the observation that Mr. van Asten claims was used to provide the position so Mr. van Asten's theory is obviously incorrect. Most likely Noonan just looked out the window and saw the island of Nukumanu located near the stated coordinates at some time prior to 0718 GMT. I didn't realize the relative size of the clearing that the team made. Impressive. 0718 GMT had nothing to do with appointments of Earhart , it conserned time points @ which weather updates to A/c would be sent from Lae airport by Balfour : 18 min past hour. In the Chater report this time indication is repeated several times (0418 , 0718 , 0918) . How , btw , would Noonan see 27 mls ahead to Nukumanu ? What other body than the sun was in sight before 071930 GMT ? EJN-2011 shows exactly how the sunset fix was established , by H.O.208 & facultative other available algorithms . If I got a new theory before me , I would first try to study it an possibly find a better one , before continuously advertising that the theory is wrong . 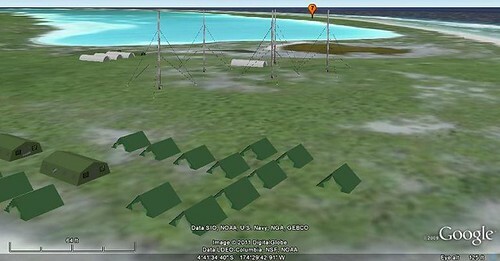 Here's a GE model of the USCG Loran station w/ 7 site in background. File too big (+128KB) to post here. If you want an email, PM me. Marty, how to post large files? Can you put this KMZ on TIGHAR's Ameliapedia?